Kubbeh or kibbe (Arabic: كبة‎) (Hebrew קובה) is a Middle Eastern dish of Iraqi origin made of bulgur or rice and chopped meat. The best-known variety is a torpedo-shaped fried patty stuffed with minced beef or lamb. 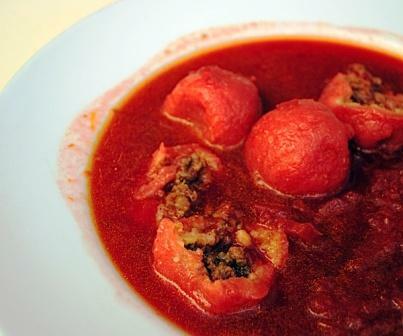 Other types of Kubbeh may be shaped into balls and cooked in broth. Heat olive oil in a large pot over medium heat and sauté the onions until translucent. Add the beets and cook for a few minutes. Stir in the tomato paste. Add the paprika and season with salt and pepper, then add the chicken stock. Allow to simmer over medium-low heat, uncovered, for at least an hour. Just before adding the Kubbeh, stir in the sugar and lemon juice. Using an immersion blender, pulse to partially blend the soup (or carefully transfer about 1/3 to a blender). This step is optional and will depend on what texture you like your soup. Heat the olive oil in a large pan over medium-high heat. Add the ras al hanout and toast, stirring, 1 minute. Add the onions and garlic and sauté until translucent. Add the ground beef and cook, stirring and breaking up with a spoon, until meat is cooked through. Remove from the heat and season with black pepper. If there is a lot of grease and fat in the pan then drain. Allow to cool, stir in cilantro, and set aside. Put the semolina and water in a large bowl and allow sitting for a few minutes until the water is fully absorbed. It should be soft, but not liquidly or sticky. Try to avoid adding additional water or semolina as it could become very sticky; if this happens discard and start over. Take a small amount of the semolina mixture and form a ball about the size of a ping pong ball, rolling it between your palms. Be sure your hands are clean and dry. Using your thumb, make a hole in the ball and work your way around the inside to hollow it out slightly. Note: Kubbeh may be frozen at this point. Put the baking sheet directly in the freezer. Once frozen, transfer the Kubbeh to an airtight container. To eat, add the frozen Kubbeh directly to the hot soup and cook for a little extra.